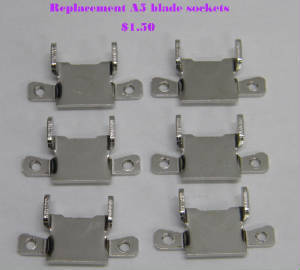 Looking for replacement clipper blades? 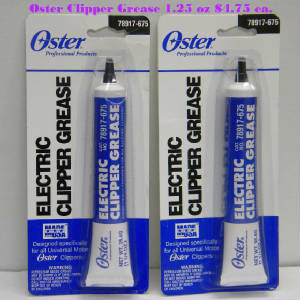 Need a refurbished clipper, clipper oil or grease, replacement parts? Read on! My Saxon Edge brand steel blades are finished sharpened and tested in fur here at Bruce’s Sharpening. 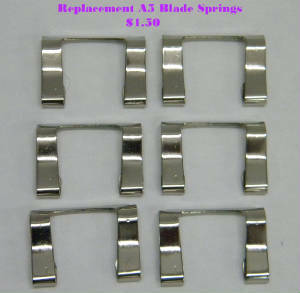 These blades are available with steel cutters or with ceramic cutters ($2.00 more). Full ceramic is extremely hard but brittle and can chip or break so some groomers prefer metal cutters. Paypal, Visa, Mastercard and Discovery cards now accepted. Not setup for on-line shopping - no time to set up, just email me at brucesharp1@yahoo.com (best method) or try calling (610 683-5175) and let us know what you need. Thank you. For those large animal grooming needs chose wide blades for 40% more cutting width! Left click on pictures for larger image. Saxon Edge blades are available with steel, or Ceramic cutters. I have in limited quanities 5F wide and 4F wides. Replacement steel cutters are available in both coarse and fine. I have both finished sharpened steel cutters and steel cutters for sharpeners at reduced prices but these must be finished ground for sale. 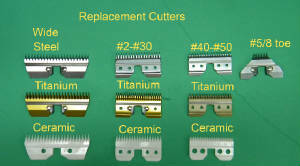 Ceramic replacment cutters are ready to go but sharpeners can get a discount for volume. I carry wide ceramics as well as regular A5 sizes. 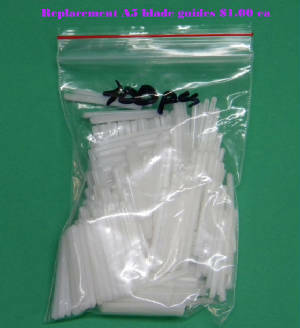 Replacement plastic blade guides, sockets and springs are also available in volume for sharpeners. 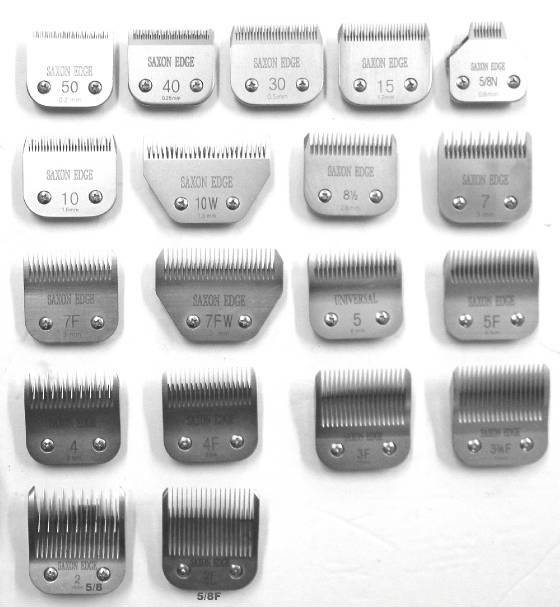 Replacement steel comb blades (Saxon Edge only) are also available. Those #40, #30's tend to get broken teeth so just replacing the comb and re-using the cutter, socket, spring, guide and screws can save your customers money. What size blade do need? Below are some gidelines. Surgical prep, Show Poodle feet, face, sometimes pattern. Stainless steel—harder, holds edge longer, rust-resistant. Surgical prep, Show Poodle feet, face and pattern, Pet Poodle feet. Excellent for using under Snap-on combs. Pet Poodle feet, between pads of some dogs. Good for using under Snap-on combs. Sensitive Poodle feet, pads, face on Poodles, Cockers and Terriers. Sanitary trim (tummy & genital area), face on Poodles, Cockers and Terriers, most cat clippings. A very short, but safe blade. Similar to the size 10 blade, but with a wider blade sweep. Good for full-body shavedowns and large breeds. 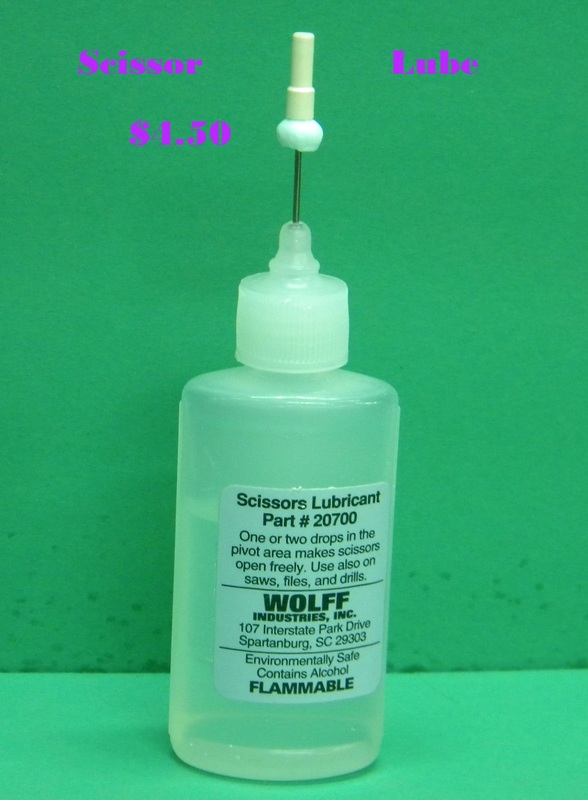 Stripping heavy coats, medium length, wider cutting surface than standard blades. Sporting Breed's necks and sometimes bodies, very smooth finish. Popular on Cockers, Springers and Schnauzer bodies. Head, face, neck and sometimes body on Sporting Breeds and Terriers. Skip tooth— body work on Sporting Breeds and Terriers, Pet Poodles, excellent for clipping matted dogs where blending is required. Finish blade for 7 Skip Tooth, unmatted cats. Skip Tooth, body work on Sporting Breeds and Terriers, Pet Poodles, body work on short trims on Lhasa Apsos and Shih-Tzus. Finish blade for 5 Skip Tooth. Body work on the low-slung Terriers (West Highland White, Scottish, Cairn, etc. ), Pet Poodles, short trims on Lhasa Apsos and Shih-Tzus. Finish blade for 4 Skip Tooth— also used against the lie of the coat of thick-coated Springers or Cockers for a very short but very smooth look. Skip Tooth, good for a plush, almost puppy look on Lhasas, Shih-Tzus, Old English Sheep Dogs— anything that you want to give a short, but not shaved look. Finish Blade for 3¾ Skip Tooth— can also be used against the grain as with the 4F and 4FC. Finish Blade— good for slightly longer puppy cut. Longest blade cut available. Cutting surface is 7/8" across. For small areas. Ideal for setting patterns such as the Dutch Clip on Miniature Poodles, great for small Poodle feet. Cutting surface is 5/8" across. For small areas. Ideal for setting patterns such as the Dutch Clip on Toy Poodles, great for small Poodle feet. Normal wear parts are replaced and original problems repaired with new parts, this may be cords, armatures, bearings, field magnet, drives, upper and lower housings, etc. 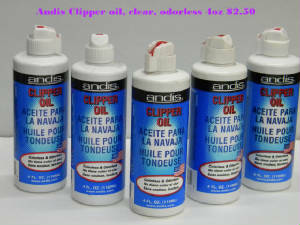 Both Andis and Oster clippers are designed for a lifetime of use and all parts are readily available and relatively inexpensive. 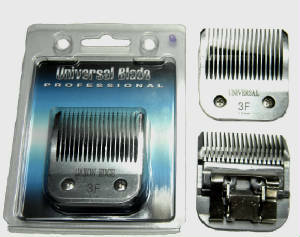 They will run like new and you can expect them to last as long as a new clippers but cost much less to own. I have both professional clippers and some home use clippers. These come and go so email me at brucesharp1@yahoo.com to check on availabity and price.